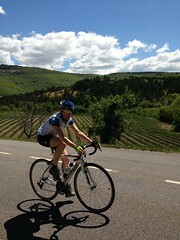 The terrain and scenery of Provence provide incredible rides for all ability levels. Ride from the house on excellent road surfaces. The roads wend through Séguret, Sablet, and Gigondas, then climb through the hill towns of Suzette and Crillon le Brave, or north through Vaison la Romaine and the northern flanks of Mt. Ventoux through the villages of Brantes, Sault, and the stunning Gorges de la Nesque. Then there is Mont Ventoux. A great, challenging ride in and of itself. A classic Tour stage that is bound to stay etched in your memory. We can plan day and overnight trips to the classic cols: Alpe d’Huez, Deux Alpes, Galibier, Glandon, Croix de Fer, Madeleine, and so on. We stay in touch with the group throughout the day with van support. This allows you to have access to bike repairs or spares we carry so your ride is not interrupted by delays or a blown day due to equipment problems. Clothing, water, and food are always nearby.